Burger, a teacher and rabbi, gives readers a glimpse into the wisdom of Elie Wiesel in this chronicle of his years as Wiesel's student and teaching assistant. Wiesel, a Holocaust survivor, writer, and Nobel Peace Prize winner, was also a skilled educator, as Burger's admiring account shows. The unpacking of Wiesel's teaching methods is the book's best contribution to Wiesel's legacy. 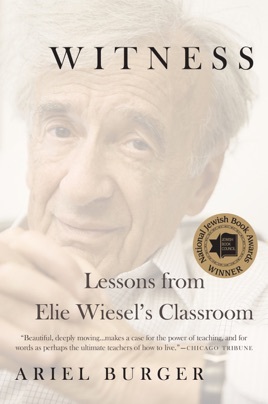 Current, former, and future educators will love the glimpses into Wiesel's practices, such as the way he guided discussions on difficult but important topics the tensions between faith and doubt, the relationship between rebellion and madness, and effective strategies for activism and the personal attention he lavished on students. The book is weaker, however, when Burger tells his own story and when it rehashes elements of Wiesel's philosophy and wisdom that can be better found in Wiesel's own words in the many books he wrote. Still, Burger's love for Wiesel, both professional and personal, shines through, and the reader will walk away with renewed admiration for this remarkable scholar, writer, survivor, and teacher.